Melania Majowicz sent this picture. I think a lot of people wonder what we do as a corps on our numerous days off. This is one of them. We graduate from college. 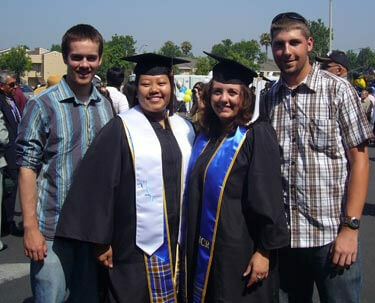 This is a picture from the University of California, Riverside, graduation on June 18. Julie (the graduate on the left) marched Pacific Crest in 2002 as part of the color guard, and received her bachelor's degree in theater. This is my third, and ageout year as a mellophone, and I (Melania) received my bachelor's degree in anthropology. Standing next to me is Patrick, the other mellophone ageout who has a couple more years left at UCLA as a computer science and engineering major.